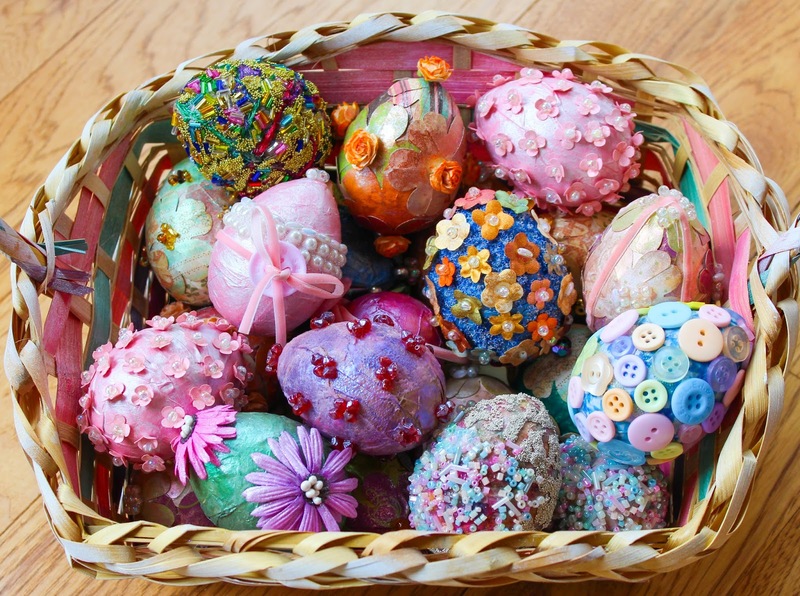 When I bought a big bag of papier mache eggs years and years ago, I was a novice at altered art. 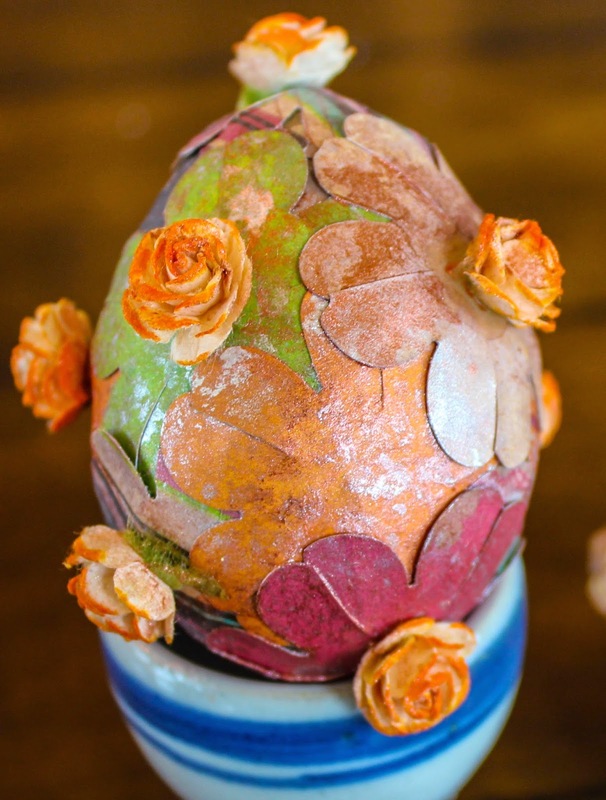 My first attempts at transforming the boring brown-papered eggs were woeful. I even taught a class in altering eggs back then, and I am glad the ladies were so easy going. LOL! Now I am a bit of an altering art addict. 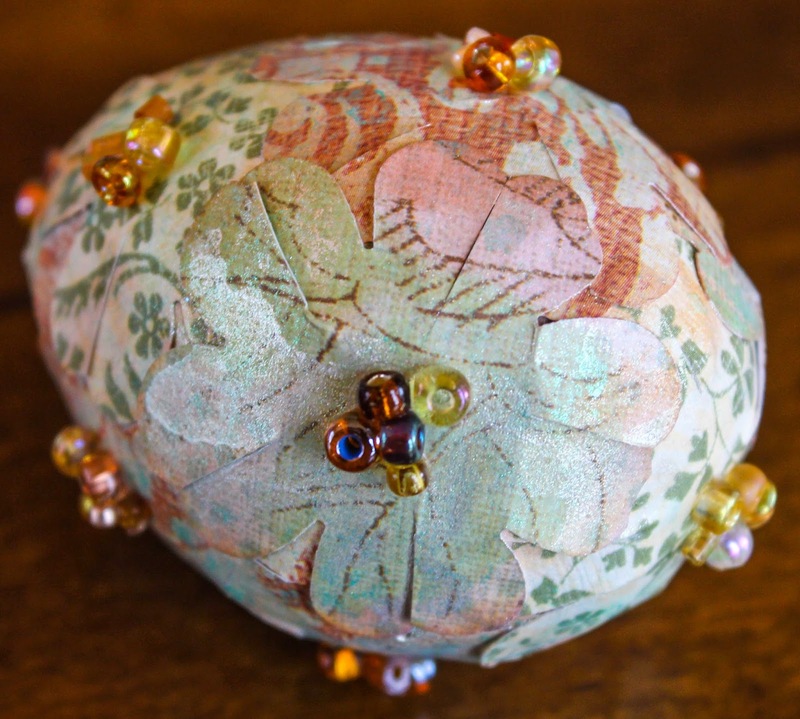 If a tin or box or other interesting vessel sits around too long, I am bound to grab it and start slapping on some Art Institute glue, designer paper, glitter, beads and buttons and spray loads of glimmer mist and apply lots of Tim Holtz Distress inks. 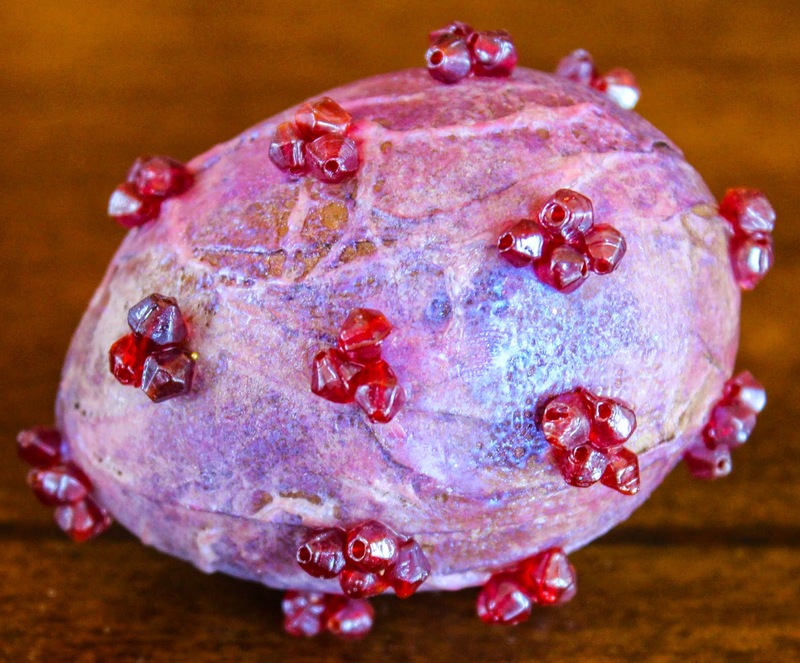 This past week, when I revisited the remaining papier mache eggs, I was filled with some kind of zest and lust, and I dove in with unrelenting energy. 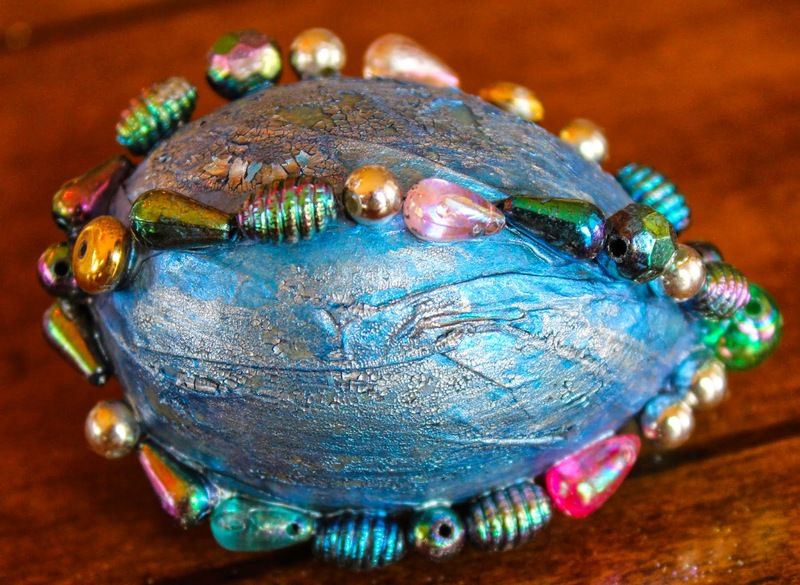 I found every time I walked past my art studio that I was magnetically pulled in, feeling an irresistible urge to paint a few more eggs or glue on more beads. I've finally run out of eggs! Here's what I've created. 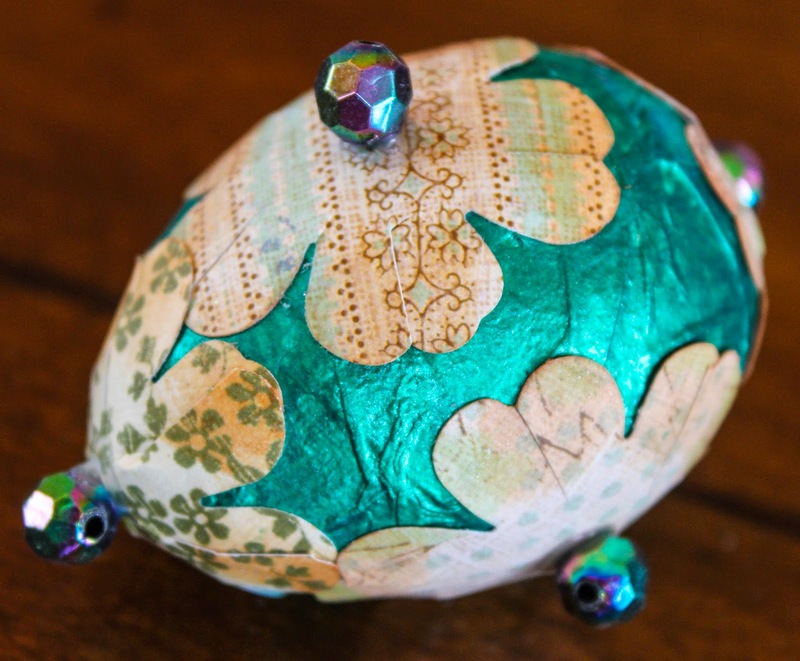 Twinkling H20s were painted onto the papier mache eggs. Pearl beads were glued on using Art Institute Glitter Glue. 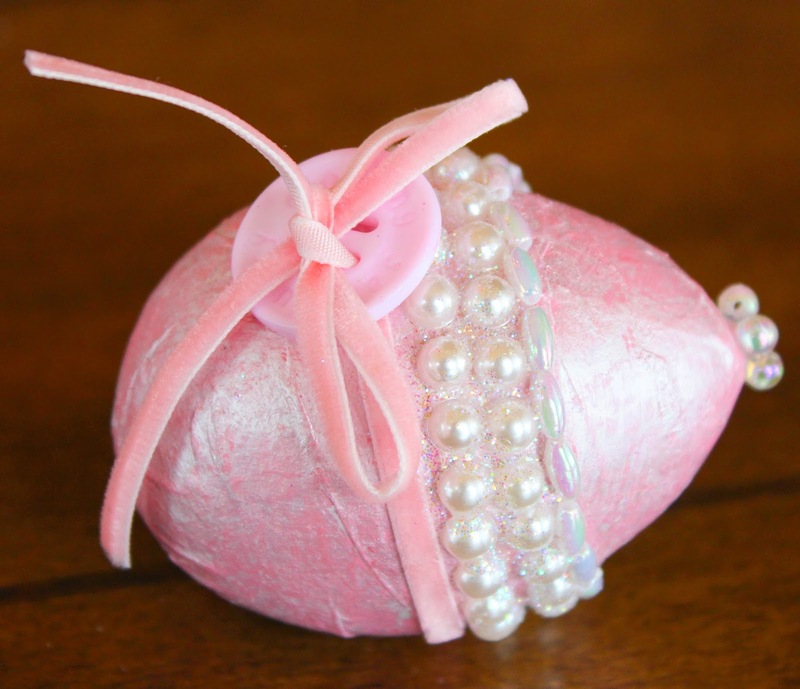 The pink velvet ribbons were glued into place and run through big pink buttons. 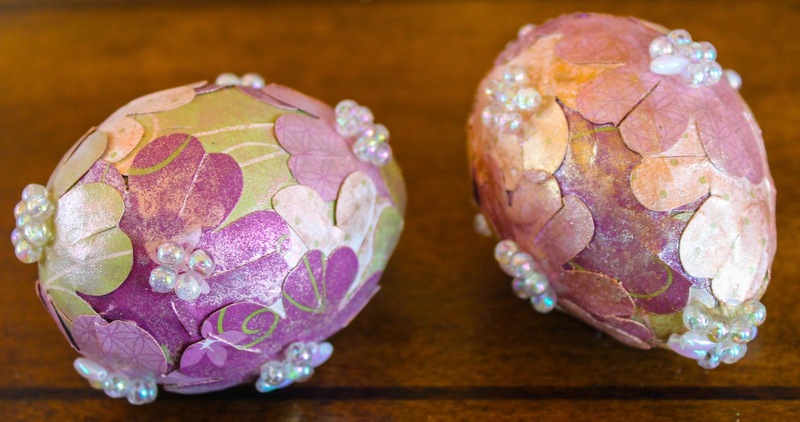 The egg on the left also has glitter. 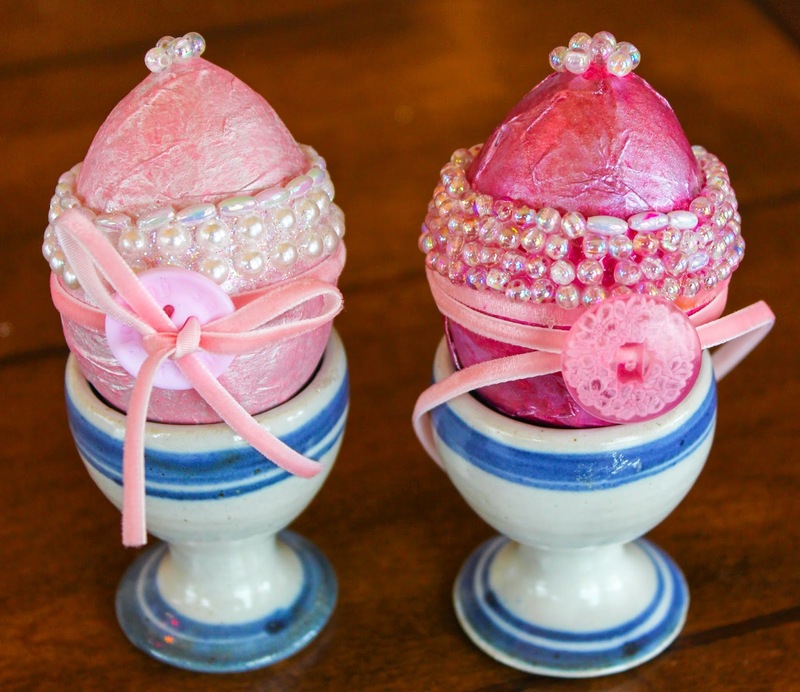 The eggs were painted in a light pink acrylic first, and then pearlescent acrylic was brushed on and partially wiped off. I used a small Stampin' Up! flower punch and pink cardstock. 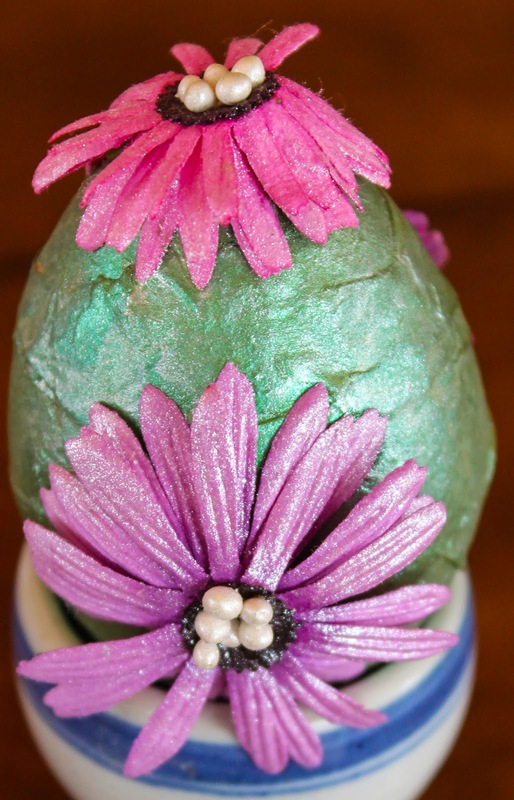 The wee flowers were sprayed with glimmer mist and glued onto the eggs. Finally, little pearl beads were glued on. This is a complicated egg! 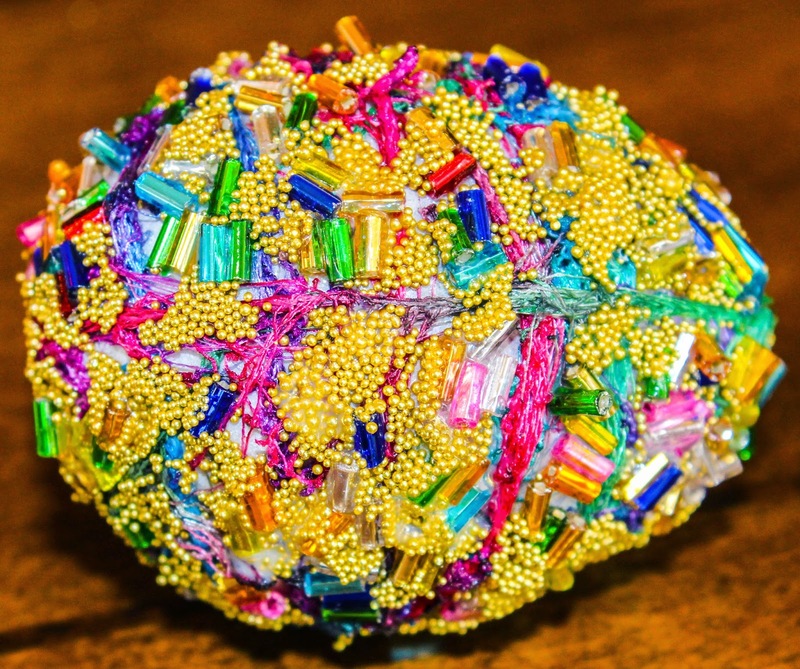 It has embossing powder, fabric, bugle beads and microbeads! The underlying egg was painted in Twinkling H20s. 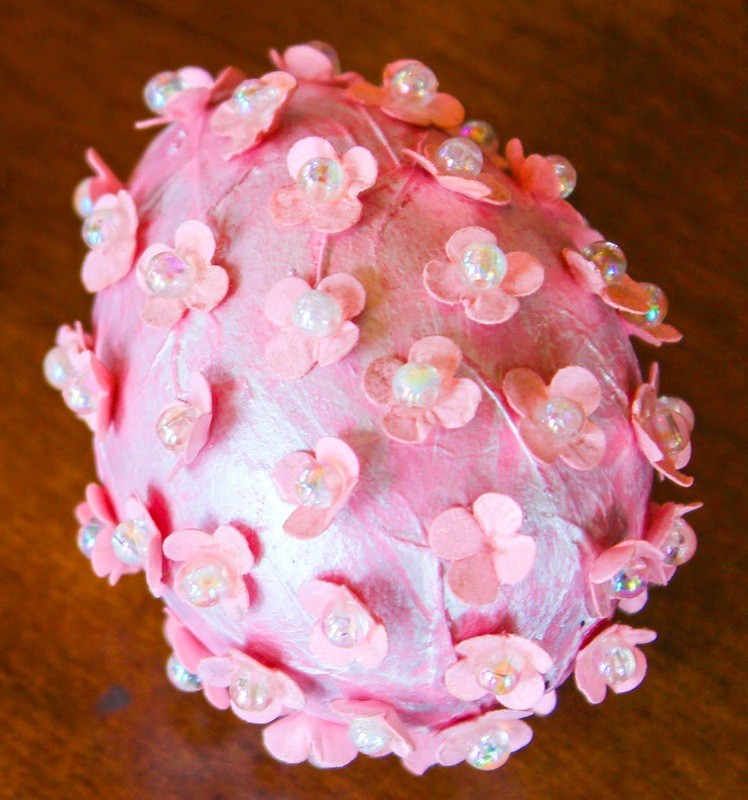 I then brushed glue all over the egg and sprinkled on Flower Soft. 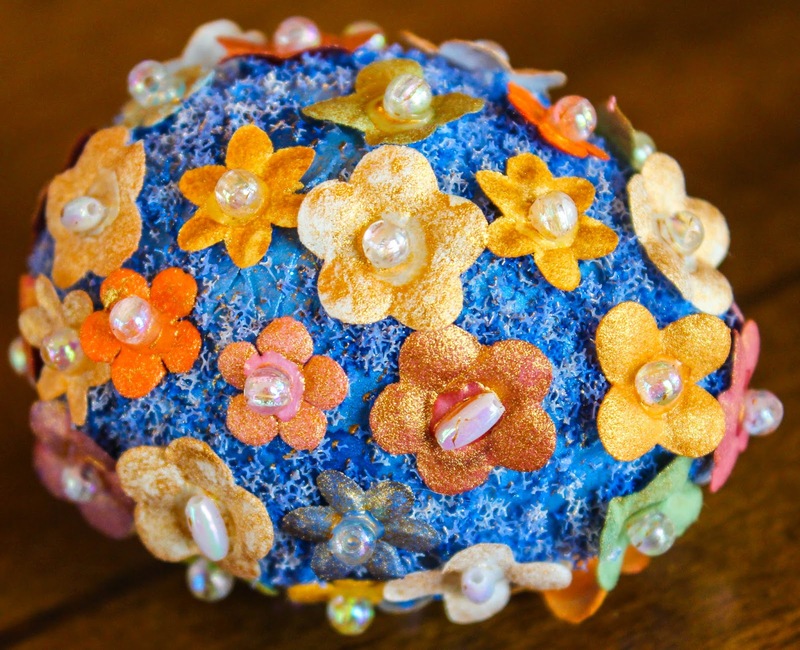 The individual flowers and pearls were then glued on. Finally, the egg was sprayed with some copper glimmer mist. 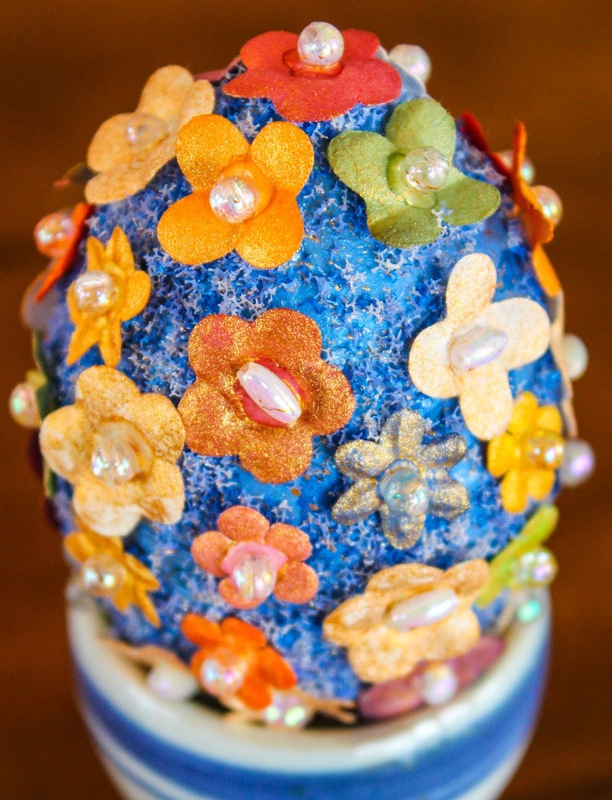 Twinkling H20s were used to color the egg. Prima flowers were stuck on and then the whole thing was sprayed with a silvery glimmer mist. Pieces of designer paper were punched out with a flower punch. These flowers were glued on with Art Institute glitter glue. Pearlescent glimmer mist was then sprayed over the egg and beads were glued on. Prima flowers were distressed with Tim Holtz inks. Pieces of designer paper were punched out with a flower punch. These flowers were glued on with Art Institute glitter glue. 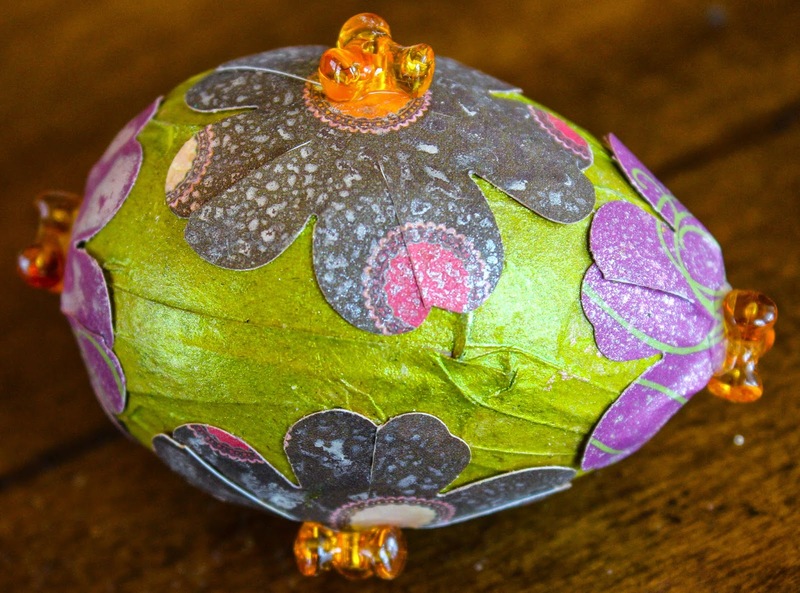 Various glimmer sprays were used on the egg and the flowers were glued on.